Virtual reality is often associated with video games, and for good reason. Most VR development is in service of immersive, unique gaming experiences that simply aren’t possible via any other medium. Some titles — particularly horror games — offer a certain je ne sais quoi that just can’t be equaled on a boring, old 2D screen. That said, gaming isn’t the only way to take advantage of that great new VR headset. The most exciting thing about VR is that we’re still just scratching the surface and discovering new ways to educate and entertain ourselves. With that in mind, here are 10 of our favorite VR apps. Top-notch sound design and wonderful, Samurai Jack-esque animation are the driving forces behind Colosse, a short-story VR experience that responds to the rooted player’s gaze, moving the narrative forward seamlessly. Described by developer Fire Panda as a “real-time virtual reality storytelling experience,” Colosse revels in its sense of scale, with clever details throughout. For instance, the “hunter” character is rendered at just 12 frames per second, while the rest of the film is in 60, contributing to its unique atmosphere. Ever fancied yourself a street artist? No, not like the guy who paints himself gold and stands still for several hours. A true street artist — think Banksy or Shepard Fairey, scaling freeway overpasses and windy rooftops to unleash your inner Rembrandt for urban passersby to appreciate (or scoff at, as the case may be). In Kingspray, you can (legally) live out those dreams, using (virtual) spray paint to make your mark on one of five digital walls, from laboratories to rooftops. Using your VR headset to watch content from Netflix, Hulu, and YouTube is fun. It’s like having your own personal IMAX movie theater to visit any time you want, without dropping obscene amounts of coin on popcorn and cookie dough bites. (Unlike next-gen IMAX, it won’t use). Littlstar VR Cinema changes the game by offering a full library of 360 degree videos designed to make you feel like you’re the cameraman. Whether you’d prefer to educate yourself about the state of Nepal post-earthquake or simply jam out to some music videos, Littlstar provides a point of view that you just can’t get anywhere else. If you want to simply sit back and watch the fish pass you by, Ocean Rift can be a calming, therapeutic experience. If you’d prefer to explore the game to its fullest, it can almost become a survival horror game with a few surprises up its watery sleeve. Little touches, like the outline of a diving mask around the screen’s edges, help to make this a truly memorable experience. If you don’t want to pay for the full experience, check out the Gear VR demo here. As it turns out, though, it can be cool. The Foo Show — hosted by Tested co-founder Will Smith, aka Foo — is technically a talk show, but it’s so much more than that. The show, funded via Kickstarter and powered by motion-capture, features a digitized Smith speaking with digitized guests about games and tech culture. You might be wondering: “Why is this in VR?” That’s a good question! The coolest thing about The Foo Show is its creative use of VR to transport viewers directly into the game environments that are being discussed onscreen. For example, the first episode (technically, Episode 0) transports viewers into the watchtower from Firewatch, where you can walk around, examine your surroundings, and interact with objects, all while enjoying insightful commentary. The following episode depicts Smith interviewing Blendo Games’ Brendon Chung about hacker-puzzle game Quadrilateral Cowboy, with part of the interview taking place in one of the game’s environments. Frankly, we’re not sure what kind of schedule the show will adhere to — if any — but it’s a creative concept that gamers should love. The app works well with multiple-monitor setups, and using your headset to swivel back and forth between screens is pretty cool. Within provides a platform to view amazing content from VR creators across the world, from crazy on-rails fantasy rides to 360-degree music videos. New experiences are added regularly, including a 13-minute, 360-degree video based on the hit TV show Mr. Robot, to entertain and educate you in the most immersive manner possible. View content from news outlets like NBC, Apple, the New York Times, and Vice Media, as well as musical groups and movie studios. The Possible, a video series from the Within team, explores technology through the lens of your VR headset, with each episode touching on different topics, like hovercrafts and robotic dogs. The show is directed by David Gelb (Chef’s Table), and new episodes are released regularly. If you don’t download Within, you’re doing yourself a disservice — the app is free, and even if some of the content doesn’t pique your interest, the available library is only going to get bigger over time. Video quality varies. It seems the animated content is smoother than the live-action content. But that’s no reason to deny yourself the Within experience. Although VR games tend to get a lot of the press attention, 360 filmmaking is an exciting — if embryonic — use of virtual reality tech. Although people are still figuring out how best to immerse viewers within film, there are some interesting experiments out there. The New York Times is producing some of the highest quality work in the field of 360 videos, and all one needs to watch them is a smartphone. Although NYT VR doesn’t have a vast library at the moment, the current videos cover a range of topics. In one, a woman relays the experience of listening to music for the first time after receiving a cochlear implant, and how it differed from her experiences with rhythm as a child, the narration accentuated by stylish drawings. 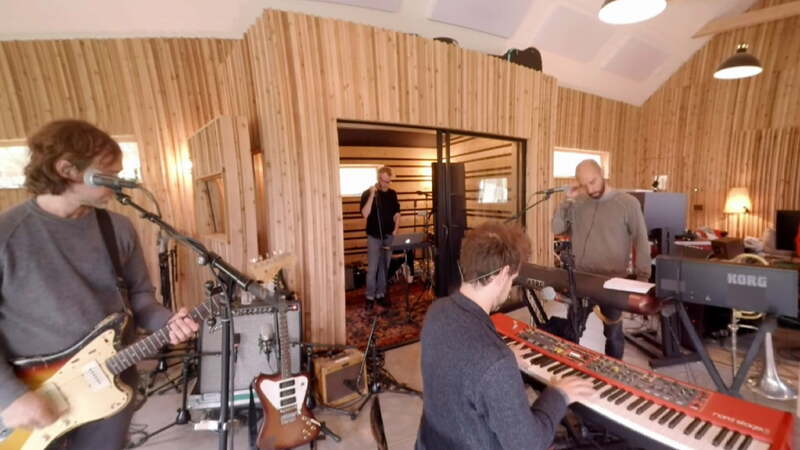 Another gives viewers a look inside the studio as rock band The National records their latest album. The production values are exquisite, images flowing seamlessly as the viewer looks around. Fulldive VR bills itself as a “Social All-in-One VR Platform.” What that means is that it provides a platform where users can browse VR content from a variety of sources, sharing their findings with friends and even commenting on them. 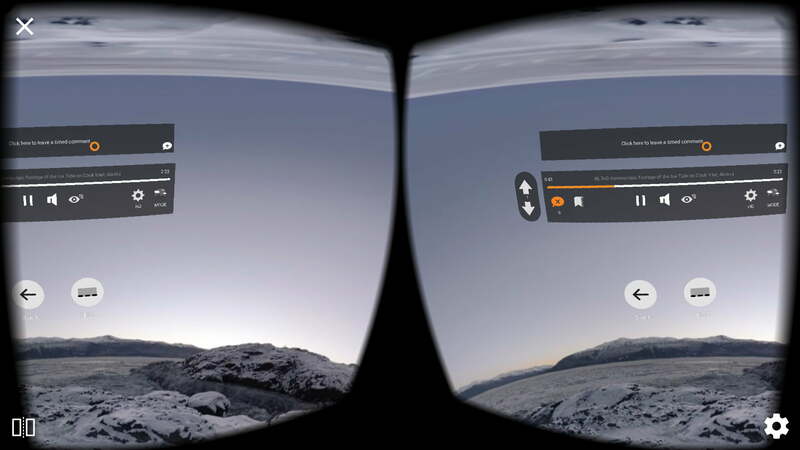 The app is compatible with Google Cardboard, and is easy to get into. The app’s interface drops users in a 3D environment where they can browse menus, adjust settings, and view their friend list. As with many Cardboard apps, users can navigate by looking at a particular icon. In addition to “trending” videos, Fulldive sorts content by emotions, like “cute” or “scary,” which isn’t always the easiest way to find what you’re looking for.